On one level, I can see how Shona Carter-Brooks got it twisted. Carter-Brooks is the Tennessee bride who decided that the "something new" to include in her wedding-day wardrobe would be her 1-month-old daughter. So she fastened the infant in the folds of her bridal gown as if she was adding a tulle bow or a taffeta sash, and dragged her down the aisle. She also preserved the moment on Facebook, where it went viral and where she wound up being vilified for possibly endangering her child and ridiculed for her tacky taste. Carter-Brooks' pathetic defense to the overwhelming criticism was a barely literate post about the baby being "covered by Christ," and about God being on their side. Once you get past the ridiculousness of it all, as well as fears about what kind of future lies ahead for this baby if she has to live with other dubious judgment calls made by her mother, the truth is that Carter-Brooks is not that much different from others who decide to accessorize with babies. Babies as props do, in fact, continue to be part of a trend. Last year, for example, The Guardian featured an article that proclaimed babies as the latest fashion accessory. Among other things, it trumpeted Givenchy's campaign to include models clutching their naked babies while wearing the latest designs, and discussed how parenthood had caused more designers to be inclined to include babies in their shows and advertisements. Other outlets have also noted that trend. Then there are the endless ads that feature designer baby slings and pouches—all ways to coordinate carrying the baby with the mother's ensemble. And even if Carter-Brooks never caught sight of designer baby ads, or shows with infants on the runway or designer baby slings, chances are she's aware of the celebrity baby-bump craze in which expectant celebrities grace the red carpet wearing fashions that emphasize their expanding girth. At this year's Golden Globes, in fact, actress Kerry Washington referred to her unborn baby as her "little accessory." 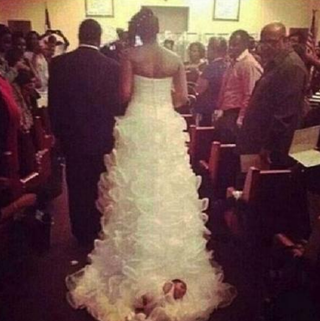 I say all this not to condone Carter-Brooks' decision to wrap her baby up in her gown and drag her down the aisle. No matter how secure she claims the child was, the folds of a wedding dress, unlike the designer baby pouches and slings, or the arms of a model, aren't designed to accommodate an infant. What she did was dangerous at worse, and tacky and tasteless at best. Yet I don't believe that Carter-Brooks was motivated by selfishness or a penchant toward child neglect as much as she was motivated by trends in which babies and baby bumps are being fetishized, as well as the social media trends that influence a lot of people, especially young, uneducated people. I believe she loves her daughter but was too driven by the idea of making a splash without gauging how dragging a baby down an aisle entangled in her wedding dress was going to look to thousands of strangers with the power to repost and ridicule her. Still, I can't help seeing this young mother as an example of what happens when social media, celebrity culture and confusion collide. For her, the aisle was her runway, the wedding gown was her designer creation and her daughter was her accessory. And while it's easy for many to condemn her, a condemnation that I believe is driven in part by her being an African-American woman who is too illiterate to explain why she did what she did—and because it tends to be easier to view actions by black people in the harshest, most punitive light—it is still important to understand the cultural context of it all. Because while we can fault Carter-Brooks for treating her baby as an accessory, she didn't start this. And she certainly isn't alone. Tonyaa Weathersbee is an award-winning columnist based in Jacksonville, Fla. Follow her on Twitter and Facebook.